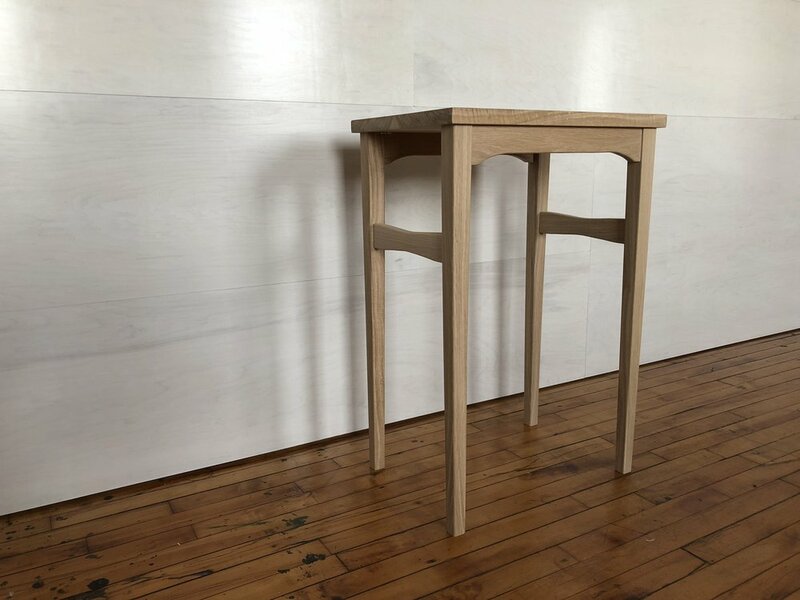 White oak dining table constructed using mortise and tenon joinery with a floating tabletop. Seats 6, squeezes 8. 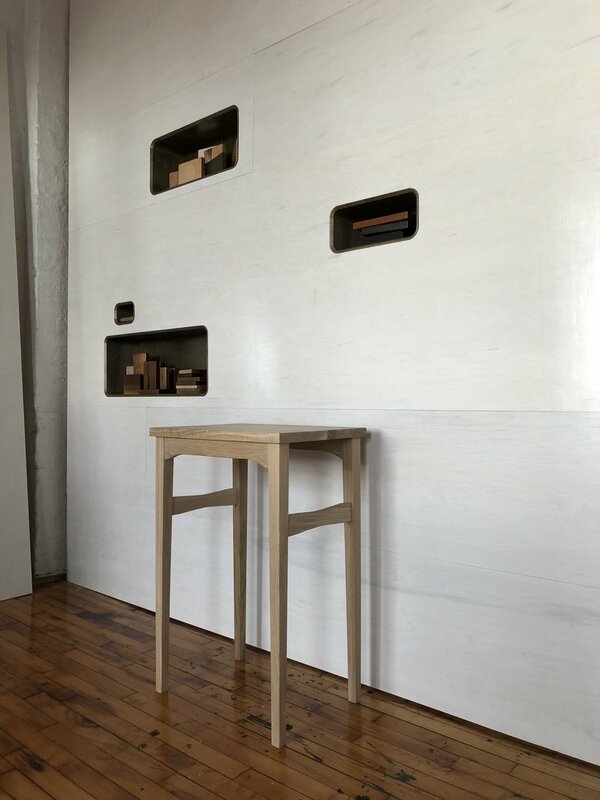 Petite custom table made from white oak to serve as a makeup station for client's dressing room. The light and simple design aids portability and visual lightness. Danish soap finish. Custom breakfast tray made from reclaimed walnut. Features hand-stitched leather handles attached with brass screws, and a personal message steel stamped on the bottom side. An enormous custom made chopping board designed to bridge a client's kitchen sink and maximize countertop prep space. Made from a piece of salvaged mulberry with a live edge and eye-popping color. A custom magnetic knife rack made from salvaged spalted maple. 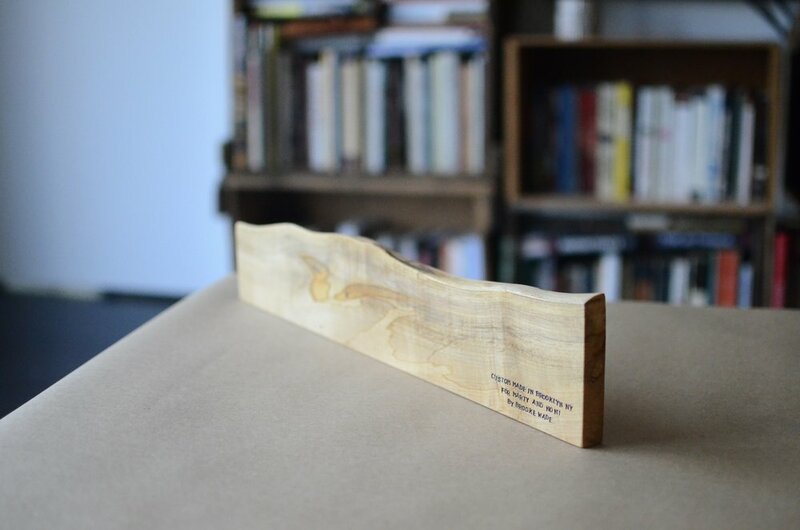 Magnets are concealed in the back by an inset spalted maple strip. Features a live edge and unique watercolor pinks, purples, and blues throughout the blonde grain. This wall hanging is made from a vintage bedspread. Originally, it was created as a functional balloon curtain for a unique Brooklyn window, with five hand-stitched, channels concealing grosgrain ribbon for easy lifting and lowering. Was repurposed as a wall-hanging when the client moved to a new apartment. A weaving and printmaking project done in collaboration with The Sketchbook Project. See full sketchbook here.